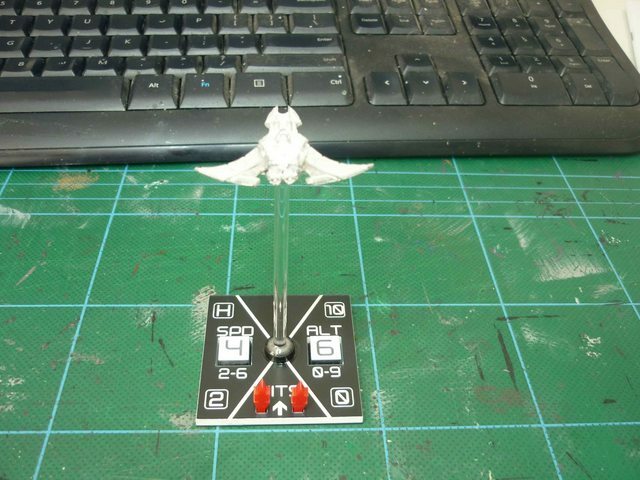 I've started this thread so that I can show some of the stuff I've done with my BSG: SB miniatures and gaming components, now, and in the future. First off, here are the bases I have painted from my 2 x starter sets. 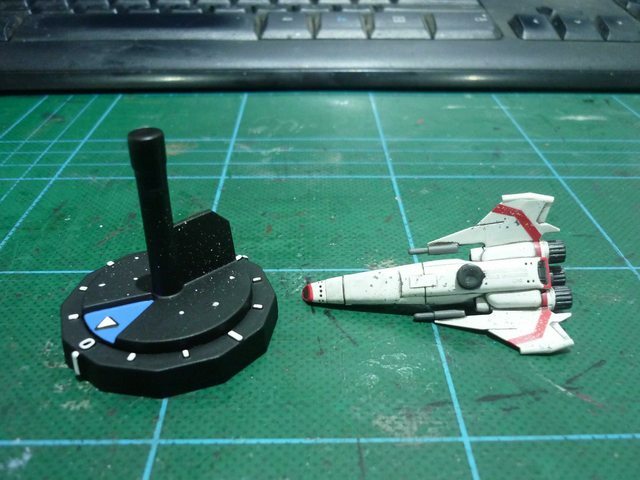 I painted the bases to match as close as I can the neoprene star field mat I play on, and I also attached magnets to the top of the flight peg and underneath the miniatures. 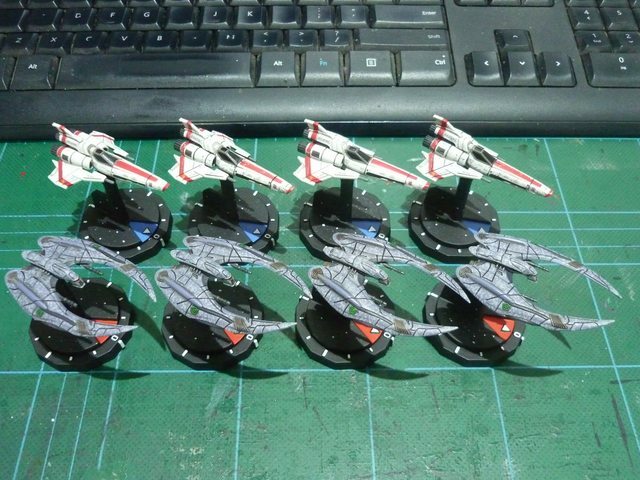 The magnets are painted with a rubberised paint called Plasti Dip. 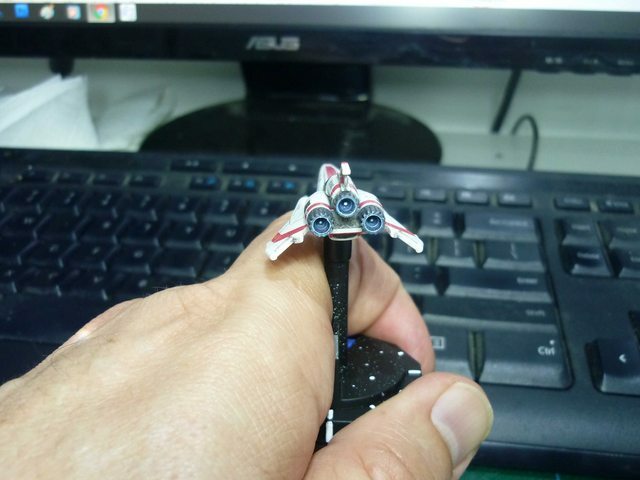 I plan to paint an engine glow on all my miniatures as well, just to make them "pop" a little more on the table top, at least when viewed from behind anyway. Hopefully I will find time to tackle that for these 8 miniatures in the next couple of weeks. That is a great idea and it looks awesome. I’m going to steal your idea soon as I can. You're raising the bar too fast. Now I have to pimp up my bases, engines and consoles! Love the mods... a little here and there really has as dramatic impact. I've only got a little more to go on the engine glow, so tonight I turned my attention towards what I want to do with the control panels, and pulled one of them apart. 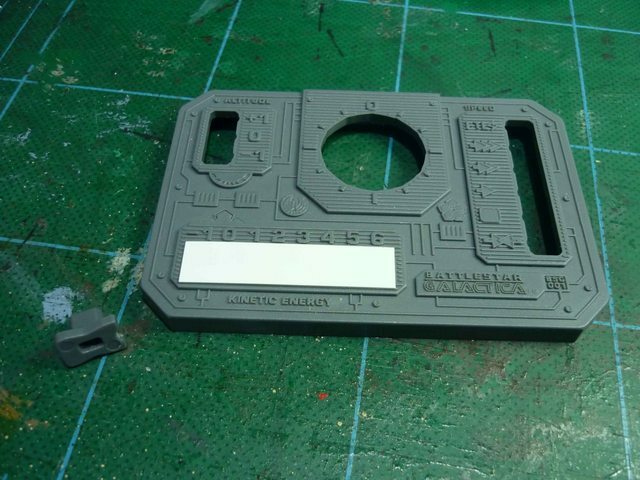 I think I will cut out strips of 0.25mm styrene and use plastic glue to glue them to the top so they cover the slot that the slider slides in. 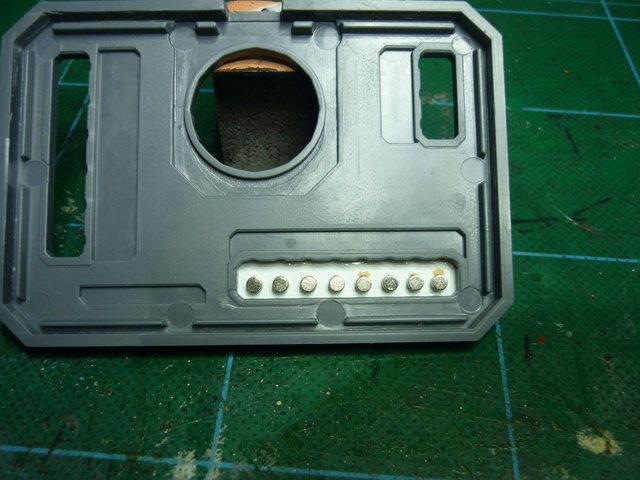 I'll then glue tiny metal washers on the underside of the styrene and in-line with the numbers on the top of the control panel. Once they are glued in place, I will fill that slot with an epoxy glue so that the washers are encased and some more strength is provided to the plastic styrene sheet. I will then drill out the hole underneath the slider a little more so that there is a 3mm round hole there, and then glue in a 3mm disc magnet, so that I can place the plastic slider on the track and have it magnetically lock into place at the number that I want. I will then paint all the plastic parts before putting it back together again. Nice project. Watching this closely. I spent a little more time on it this arvo, and glued the styrene sheet in place with plastic glue and then used superglue to glue a double stack of 3mm x 1mm disc magnets in there (making each one a 3mm round disc that is 2mm thick). I used a spacer to make sure they are level with each other horizontally, and lined them up vertically with the notches so that they in turn line up with the numbers. The plan is to mix up some epoxy glue to pour into and fill this rectangular area up to the lip so the magnets are encased and additional strength will be added to the modification. Next time I work on this I will add a 3mm x 1mm magnet to the underneath of the slider. Cor! A whole new Forum section/thingy...............lots to see here. Those bases look the business, Rory, and I really like the engine glow effect you've achieved. I spent months trying something similar on my "Full Thrust" starships, but never found a result I really liked. BTW: thread moved to the 'Ship Mods/Painting' sub-forum. Last night at work on night shift, I decided I wanted to make a Unit Record Panel, so I could track damage and have the unit stats immediately at hand all on one panel...then I thought perhaps I could actually simplify the control panel by doing the same thing as I don't play with height levels. So when I got home this morning, after a coffee (or two) I went to work in Inkscape and created the basics of these two panels so they could be laser cut in two-tone plastic that is 3mm thick. 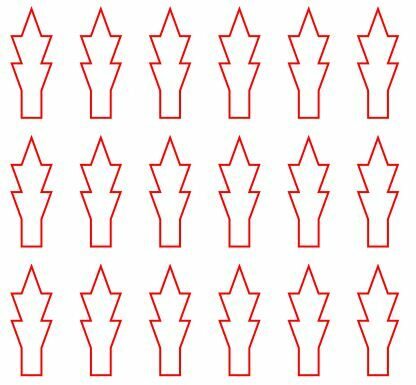 The red lines are cut lines, and the black areas are etched lines/shapes/text etc. The plastic is white underneath with a black top, so that when you etch away the black top, it leaves the white underneath exposed, and is great for having text, lines, shapes etc stand out really well. 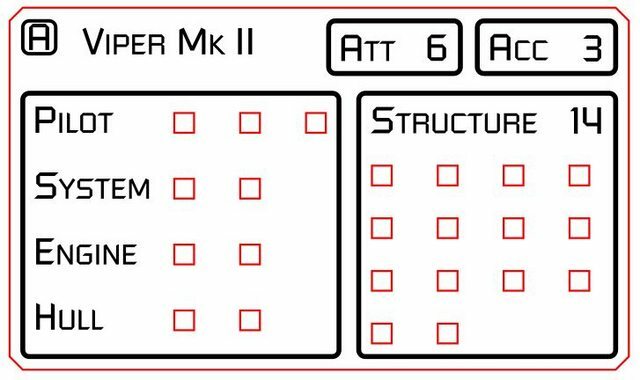 The Control Panel will utilise 3mm cube magnets (that will glue into the small red squares shown in the pics below) to allow markers to magnetically lock into place to show your KE, Speed and Rotation, and the Unit Record Panel will use red acrylic "pins" to track damage. I've used the above methods to create bases for another game I used to play, it is pictured down below, so you can get a feel for the look I am aiming for. I still have a bit of mucking around to do to adjust them a little more to suit my tastes, but this is pretty much how they will appear. When I have finished designing them and have had some cut out and confirmed everything is working correctly and there are no mistakes, I'll share the files for people to download and get some cut for themselves if they are interested in this kind of stuff. Last edited by Rory; 01-23-2019 at 20:38. Wow! Fantastic project! I can't wait to see the result! Because you have opened a control panel, I have a question: do you think there is enough space inside to put some coloured led and a watch battery to make it works? Thanks Swordancer...I am currently in the process of getting samples of the pieces I designed laser cut for proof of concept. I'll show pics when I have them. IN regard to the room inside the control panel. It depends on the size of the LED's and batteries, and how many you want to put in there and where...but generally speaking, I do think there would be enough room in there for a disc battery, thin wires and some small LED's, yes. This concept rightfully belongs in its own thread. 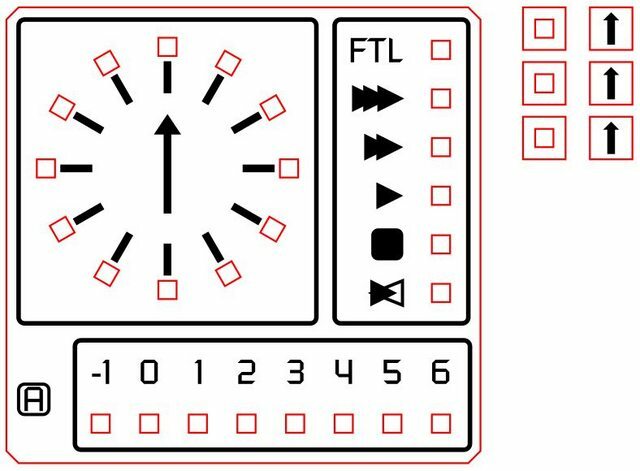 Remodeling/redesigning the control panel is not repainting or modifying one. This would better fit in a Game Aide. When I figure out how, I will segment this off, with a redirect. Or, Rory, you could start a new thread, and put a link to it, yourself. Is the panel glued together or will it come apart without breaking if I use a bit more force? It has a small amount of glue...the plastic is very robust though, and didn't seem like it was even close to breaking when I pulled mine apart. I used a razor to run down the seams of each edge on the back and then flexed the panel until it came loose, you can also push on the dial to get some give in the centre of the panel. Even More WW1 Art & Pics!